Things couldn’t be better for Trudie Fine and her partner, Zachary Cohen. It’s the first big job for their catering company, A Fine Fix, and everyone who’s anyone in the Washington, D.C. area will be at the Schwartzes’ backyard Mexican fiesta. …until a dead body is discovered floating in the pool. When Zach is arrested as the prime murder suspect, Trudie sets out to clear him and find the real murderer. 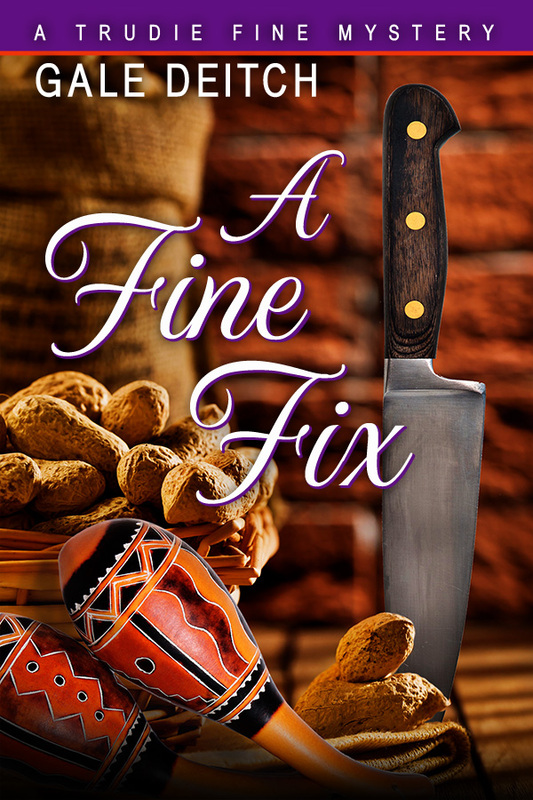 Life gets spicier than a jalapeño pepper when she realizes she’s the focus of three men’s affections, including the unnerving detective handling the case. Soon, however, Trudie is reaching for her favorite knife, but not to chop vegetables. 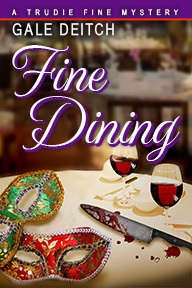 Trudie Fine’s romantic dinner with Detective Daniel Goldman is cut short by a gruesome murder. When her good friend May Dubois is discovered sitting by the body of her dead brother, holding a bloody knife, the case seems as cut and dried as sliced okra. From the start, however, Trudie believes in her friend and sets out to prove May’s innocence. But if May isn’t the killer, who is? Taking over as temporary manager at May’s New Orleans-themed restaurant to do some sleuthing plunges Trudie into a jambalaya of dangerous waters. Available at Amazon.com, barnesandnoble.com and other online retailers. Both books are now also available in audio format from Audible.com, iTunes and Amazon.com. It’s the week before Thanksgiving, and business is bounteous for Trudie and Zach’s catering company, A Fine Fix, beginning with a posh art exhibit at the prestigious Christine Dugan Gallery. When the guest list includes art connoisseurs, wealthy collectors, and prominent socialites, not to mention a well-respected art critic from The Washington Post, a successful event can only mean future bookings. But the discovery of a gruesome murder brings the high-class evening to a screeching halt. In the days that follow, Trudie faces a cornucopia of troubles as her curiosity lands her in plenty of hot gravy. Not even her new canine friend, Zeus, can protect her against threats to her life or keep the killer off her trail. Trying to get her footing and find the murderer is like walking through a sweet potato casserole. Trudie has seen how deadly art can be, and now she’s a sitting duck.